His first flirtation with Jim Murray’s Whisky Bible has The Whisky Virgin questioning his approach to tasting whisky. Has he been doing it wrong all this time? 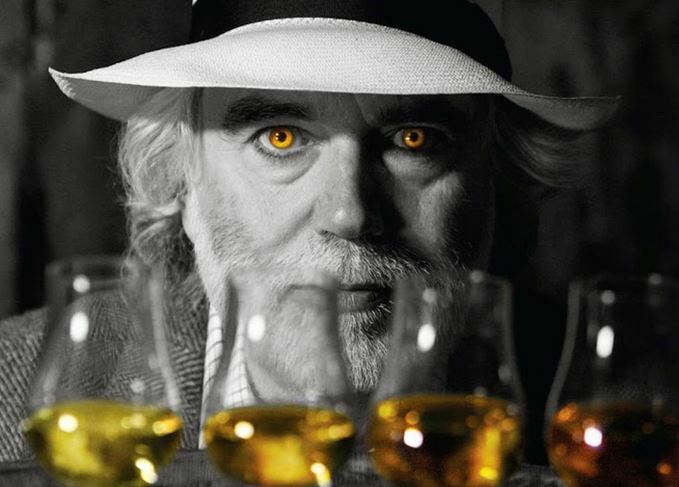 Eighteen commandments: Jim Murray lays down the law when it comes to whisky tasting, but is he right? I’m afraid I have to kick off this month’s piece with an apology to all you lovely Scotch botherers. It turns out that every time I sampled a dram and wrote about it for your amusement, I actually tasted it all wrong. I haven’t been following proper drinking procedure and for that I am sorry. This realisation came when I got my hands on a copy of Jim Murray’s 2018 Whisky Bible. This annual guidebook not only contains old Jim’s thoughts and feelings about hundreds of different whiskies from around the world, but also his 18-step guide to tasting whisky. Eighteen rules! Bloody Fight Club only had eight. And there was me thinking Scotch was just a drink I could knock back without a care, like it was common Fanta. In an effort to mend my ways, I’m going to try to taste some whisky on a serious level. Tonight’s mission is to crack a bottle – in this case a Highland Park 12 I picked up on the cheapsky at Tesco – and try to follow the rules as I go. Who knows what kind of whisky magic I’ve been missing out on? Time to find out. The first three commandments laid out in the Murray Method™ are about avoiding distracting scents and sounds to get yourself in the zone. Easier said than done in a South London flat-share above an illegal laundrette, but I do my best to clear my living room of smelly debris and wedge a folding chair against the door for maximum solitude. This makes sense to me. It’s probably hard to take a serious taste of Scotch when you’ve just cooked a curry or are covered in Lynx Africa. Jimmy also recommends black coffee or some dark chocolate to cleanse the palate, but I’m fresh out of both so I make do with a swig of off-brand diet cola. The next set of Jimbo’s rules are about the serve. I’m told to use a stemmed, tulip-shaped glass to concentrate all the deliciousness compounds in my whisky. I actually did pick up a few of these last year after I realised that drinking Scotch from old Sports Direct mugs was doing nothing for me. Not sure why the stem is so important – easier to gesticulate with maybe? Anyway, I totally get that proper whisky glasses are important. He also says a big no to water and ice, and insists that your bottle goes nowhere near the fridge. I quite like a cube or two in my tumbler from time to time, but I take his point about tasting a new dram in its natural state. I’m on step eight and I’m not even allowed a taste yet. C’mon J-man, I’m dying of thirst over here! Before I can dive in, I apparently have to warm up the glass with my hands to get the contents maximally tasty. Once it’s good and ready, I’m to hold my dram out at arm’s length. Is this like a yoga thing? I have to admit, I feel a bit daft. Following Notorious J.I.M’s instructions to the letter, I uncover my glass and move it towards my face, bringing it to rest on my top lip and inhaling slowly. I try to breathe normally while rolling the tulip between my nostrils. I’m not sure this is something I could do down the pub, or in front of any other living human, but I have to admit I am in a whole world of smells. This must be how dogs feel. Seems like resisting the urge to stuff my whole nose in my glass and taking a bit of time to sniff around before draining my dram is a sound move. Step 11: Ah finally, I’m allowed a sip. Lovely Scotch, all flowers and honey and smoke and… oh wait, I’ve gotten ahead of my fool self. Jim-Jim says the first taste is to be totally ignored. Seemed fine to me, but apparently sip number two is where the real tasting happens. I start to ‘chew’ my malt, swirling it around and breathing in and out. Am I sort of gargling? Is this what he’s telling me to do? If I accidentally choke to death on whisky with the door wedged closed, would my parents lie to people about what happened to me? So many questions. Amazingly, I do feel like I’ve got a lot more out of this here hooch on the second go-around. That said, steps 14 and 15 are a little over my head, describing ‘shape’ and ‘balance’ and so on, but I think I know what the Method Man is getting at. These guidelines may not be appropriate for every setting – or many settings, for that matter – but I think there’s a lot to learn here about taking time to think about what you’re drinking. Rule 16 of Scotch appraisal is one I can totally get on board with: ‘Never make your final assessment until you have tasted it a third or fourth time.’ Will do, Captain J, here’s to you. His last two rules basically amount to him saying you should form your own opinion about a whisky, regardless of what anyone else says, and stop tasting when you can’t tell the difference between whiskies any more. Strong stuff. I get that the Murray Man’s 18 rules are meant for serious – no hint of irony – whisky tasting and as such they don’t really need to apply to your everyday malt snaffling. Did following the rulebook make me appreciate my whisky more? Absolutely, and it also made me think for the first time about how there might be different ways to smell something. Still, I think there’s a time and a place for covering yourself in after-shave, chugging down spicy food, throwing some ice in a tumbler and enjoying a carefree whisky with the fam. In future, I’ll think more about how I’m approaching my drams, but I don’t think I’ll stop drinking whisky however it feels right at the time. But then J-to the-I-to the-M Murray is not a mere man like me, he’s a pro taster. I’ve heard rumours that he can taste a glass of Scotch through a brick wall and tell you how the barley was feeling the day it was malted. I also think I read somewhere that he actually invented rye whisky; imagine that. Thanks for the wise words, Jim-lad – and the baffling ones – I’ll be sure to hold a glass of whisky at arm’s length and then carefully move it to my face in your honour soon.